On Sunday, 29th May 2007, I entered my dog, Darcy, into a field trial. This may seem very ordinary to most people as many working dogs run in trials all the time. The difference here was that this was the very first event that I had ever competed in. I am relatively new to the dog game and Darcy is just two years old. To add to the complications of being new to the game, Darcy was also a field spaniel - a relatively rare breed of hunting spaniel relegated for the most part to England. Seeing this breed in any venue is a treat in its own, but it has not been seen in a field trial outside of England in well over 20 years and even then it was an uncommon event. In addition to all this, Darcy was a big, black, handsome boy by the name of Ch Winfarthing Pride and Prejudice CGN TDI TT, in other words, he was a show champion. This might not seem much, but there are many who believe show dogs do not belong in the working arena. There was a lot of pressure placed on the both of us. The least required was for us to prove that the breed was capable of competing at this level in both venues... and was a true dual purpose dog. 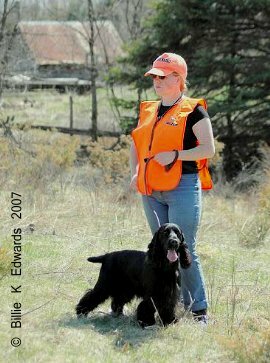 When I had been entered into the Outaouais Valley Sporting Spaniel Club Field Trial, I had thought that he was the first field spaniel to be trialed in North America. Enquiries in Canada didn’t reveal any information about field spaniels who had run in trials before. It was only during the trial that those attending reminisced about two breeders who had run field spaniel in the pigeon trials back in the 80’s. This was news to a many field spaniel fanciers, and we were thrilled to learn that there was a history with the breed hunting in Canada. I started my early training with Darcy a few years ago by reading books on hunting and making the mistakes that all beginners usually make, and then some. I looked around for a trainer to help with Darcy but could not seem to find any in the area. It was not until Darcy was almost 18 months, and had several bad habits that needed correcting, when I finally found someone who was willing to help me out and take a chance training both of us. Darcy’s bad habits included hunting for himself, not being steady, not retrieving consistently and generally doing what he wanted to off leash. My trainer advised me to go back to basics to undo all the problems I had caused. This meant going back to doing puppy retrieves in my hall to get the consistency back again. Despite my enthusiasm that he just needed direction, I was consistently told by members of the working community that it was unlikely that he would ever be a trial dog; He didn’t show natural quartering skills; didn’t listen off lead and showed no willingness to please me. The main fault though was that they considered him a show dog from show stock and therefore couldn’t be good enough to be trialled. "I am a daydreamer, and during the entire training process had always thought that a light bulb would suddenly come on with Darcy and he would be the hunting dog I always knew he was inside." What they were missing was the fact that this breed may be shown in the conformation ring, but it has always been traditionally worked. It is a dual purpose breed that you can show one day and work the next. As for being from show stock, Darcy has an English sire that has many field trial placements in his immediate pedigree. This breed is simply too rare to have anything resembling a show line. There is only one line, and everyone takes from it, be they hunters, obedience, trialers, agility competitors, trackers or show handlers. The one thing Darcy DID have going for him, was his prey drive. The moment he caught scent of a bird, he was off in a flash. It was explained to me though that most breeds had prey drives, be they gun dogs or toy poodles. But since he had that at least, I might hope for one day maybe getting a Working Spaniel (WS) title on him. The WS test does not require the dogs to be steady; they only have to retrieve within one meter of you and can be on leash until they are cast off. Now it was true that Darcy was playing me the fool off leash, and he certainly didn’t understand what was wanted when we tried to get him to quarter, but Darcy did use his nose. I KNEW if he had the nose for it, quartering just had to be a step away. Once we introduced pigeons, his quartering and flushing skills came to him naturally, but the obedience took longer as *I* needed to be taught that I was the pack leader, not my dog. Over time, I went from hearing "Darcy would never get past WS" to "He would never get past Junior Hunter", then Senior Hunter, then finally "Maybe he could try for a Master Hunter title." It got to the point that although we knew he probably wouldn’t have a shot, why not try a field trial. Worst case scenario I’d gain experience doing it. I am a daydreamer, and during the entire training process had always thought that a light bulb would suddenly come on with Darcy and he would be the hunting dog I always knew he was inside. But it was amazing to actually see it happen for real. That said, the field trial was less than a month away and Darcy still wasn’t quite there yet. He had the basics, and was steady to a dummy, but got over excited when he flushed a live bird, and certainly wasn’t steady to one. I spent every day during the April month working with Darcy at the farm and sacrificing more sleep and time than I want to think about. I just wanted to prove that not only could field spaniels still hunt, but they could do it and be shown at the same time. I understood completely that not all dog breeds could do both, but honestly believed that field spaniels were one of those few remaining versatile breeds left, saved only through its rarity. Under the wonderful guidance of my field trialing friends, Darcy and I progressed quite quickly that last month. In only three weeks, I was feeling confident that he would not embarrass me - and that I would not embarrass him. We may not do anything more than that at the trial, but we would at least give them all a show. For the first day of the trial, I did a lot of extra work to keep my mind preoccupied and was the shagger for the open stake. This meant that I was the one who picked up the retrieved birds and put them in my basket. This offered me a front row seat of the trial, and a good idea of what I would be up against on Sunday. Some of the amazing dogs I was watching that day were the competition the next day in the limit stake. I watched as one competitor after the other moved to the next round, and started to wonder if entering Darcy wasn’t such a good idea after all. He was going to look pretty "ordinary" compared to these guys. I also had no idea IF he could behave under pressure, as this was his first competitive event in the field. Sunday eventually rolled around and it was finally Darcy’s day to trial in the limit class. I spent the first two days listening to people express sincere interest in the breed, but also disbelief that a field spaniel could do anything more than be a "pet hunter". A few felt that I would probably be doing myself a favour by sticking to work that they believed was more "suited" to a field spaniel. Added to all of this was again those two little letters clearly printed in the catalogue in front of Darcy’s name, "Ch". This was a far worse offence than bringing a non-springer to a field trial. That said, almost everyone was helpful and polite to us. They gave me extremely helpful advice about trialling and honestly seemed to want me to continue to compete, but I felt also that they would prefer me to continue with springers, rather than this silly idea of trialing a field spaniel, and a "show" one for that matter. When I finally got up to the field to wait my turn with Darcy, I was shocked to discover that the wind was blowing from behind me towards the dog. 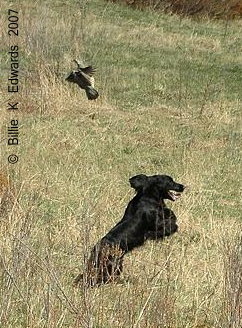 This type of wind can sometimes trick the best of dogs, but Darcy had NEVER hunted anything except into the wind or a cross-downwind. During my reading of the rules to ready me for the trial, I had mistakenly thought that this type of wind would not be used in the limit. This was incorrect as this only applied to the puppy stake. Our turn came quicker than it should have as a more experienced dog went out quicker than expected, and I was hurried to the line, not quite sure what had just happened. A few dogs that had done really well yesterday in the open stake were now leaving the trial for being unsteady. If I wasn’t nervous before, I sure was now. If such wonderful dogs were making this simple mistake... what would Darcy do? This didn’t help my confidence much. It was not that I didn’t believe in my dog, it was just that I suffered from typical performance nerves. Anyone who had watched me in an obedience trial knew this already. One handler had earlier given me a piece of advice that suddenly came to me. He had said, "Don’t mess up." This made me laugh and managed to calm me down. I could then concentrate on the words of wisdom my friend who had been helping with Darcy’s training told me. He said that my dog knew how to scent more than I did, so I should just go out there and try not to over handle, he’d figure out the wind on his own. To be honest, at this point, I thought to myself if he didn’t figure it out, I sure wasn’t going to; so it’d be the best for both of us. I walked to where my two judges, Alex Smith and Sean Hassett, were waiting. When I arrived in line, Alex turned to me and calmly explained what he wanted to see and that everything was going to be ok.
"Every time the wind changed, Darcy quickly adapted his scenting and was able to cover a lot of ground efficiently. Within the first few turns Darcy had flushed his first bird." I nodded as confidently as I could because it was time to be confident for my dog. I placed a VERY excited and VERY wiggly Darcy in front of me and took off his hunting lead while wondering if his normal steadiness would be lost in all the excitement. But Darcy just sat there. He looked at me expectantly, waiting for the two words that would let him run free. The judge whispered for me to begin and I yelled, "High on," casting Darcy off into what I thought was the wind (it kept changing from behind my left arm to behind my right arm), and off he went. By now, there was quite the crowd in the gallery watching quietly since Darcy had become the "novelty dog" of the weekend. Most of them had been curious to see what this dog could do. As my friend had predicted, Darcy immediately figured out he was getting no scent and suddenly cast himself off far ahead of me. It’s a very scary thing to watch your dog break the perfect windshield wiper pattern and run 50 feet in front of you. A part of me wondered if this was it. That I’d just lost him, like in our early training days, and would be spending the next 20 minutes chasing after him. But without missing a beat, Darcy started quartering back to me. I honestly couldn’t believe my eyes as I had never worked with him on this. Every time the wind changed, Darcy quickly adapted his scenting and was able to cover a lot of ground efficiently. Within the first few turns Darcy had flushed his first bird. The bird jumped up and it was obvious that he didn’t have enough flight in him. This is a HUGE temptation for a young dog, especially with the excitement of the moment. I could feel my heart skip a beat right away. To my delight though, Darcy slammed into a perfect sit and watched the bird like a hawk. The judge gave me the nod and told me to let him flush the bird again. I called Darcy onto the bird, and this time he REALLY flushed the bird hard, learning that the average flush wouldn’t work just wouldn’t work on this guy. The bird went high and Darcy once again slammed into another perfect sit. The gunner shot the bird and the bird dropped a little distance away into some light cover, but on a good line. Darcy was rock solid the entire time, not moving a muscle except to mark the bird as it dropped. The judge tapped me on the shoulder, signalling that he was happy with the hup, and that it was now time to let Darcy have the retrieve. I yelled "Darcy" and he was off making a bee line to where he thought the bird had landed in the grass. He seemed to be doing well and got a bit distracted by some feathers on the way over, but quickly began using the wind to successfully find his lost bird. I let out a sigh of relief that I had been trying to keep hidden since first walking onto the field. Once he had the retrieve, he quickly ran back to me and presented the bird. He gave it up with a soft mouth and no fuss at all. The judge took the bird and examined it to make sure that Darcy had not been hard with it. I was then given permission to attempt my second contact. Darcy was again sent off, and for the second time compensated right away for the difficult wind. He went far enough ahead to show his pattern well, but also looked to me for direction every now and then. He would then go where I motioned to try to ensure he covered all the ground. He quickly found his second bird hiding in some junipers. He flushed it with great enthusiasm and once again the gunners shot the bird. This time though, it fell over the rise in the hill and out of sight. I knew then that Darcy’s marking abilities were about to be put to the test. Darcy was once again steady for the fall and the judge allowed me to send him off. He went over the ridge and out of sight. As I am not allowed to move from my sending position I had no idea what had happened whilst he was gone. It couldn’t have been long, but it seemed an eternity before Darcy popped over back the ridge with the bird in his mouth. I knew then that Darcy could honestly do no wrong at this point; he had done everything I could have hoped for. Once Darcy had returned, the judge instructed me to pass the bird up to him again for examination and, as my lead was handed back to me, I was told "well done" and bid good day. "Before the start, it would have been unprecedented for him to place in the stake. But I couldn’t help but feel that we had done really well out there." I turned around - and only then did I notice the huge crowd waiting behind me in the gallery. When they saw me turn to face them, I could hear the cheering from my friends and could feel the grin that was growing on my face. I was pretty emotional to begin with because I was nervous, but now I was so filled with emotions of pride and a sense of accomplishment that it threatened to overflow into tears; so I quickly took my congratulations and went back to the quiet of my car. I concentrated on Darcy seeing to his needs and giving him a well deserved rub down. He had done everything I had asked of him and more under pressure. I couldn’t have been prouder. I had a gruelling wait 'till the end, not only of the limit stake but the third series in the open stake, too. I was thrilled that he had done the breed proud, but still curious to know if it had been good enough to earn a placing. Before the start, it would have been unprecedented for him to place in the stake. But I couldn’t help but feel that we had done really well out there. I started to imagine that we might get a fourth or maybe even a third placement. When they came to the limit stake awards, they announced them in reverse order with the fourth place dog being called out first and so on. In this there were no real surprises for the dogs that placed fourth, third and second. These went to dogs I would have expected to place beforehand. When I realised that we were not second place, I was disappointed as I had really hoped for a placement with Darcy, but it was not unexpected. I had accepted my fate and just decided to be proud of our performance when one of the judges announced the first place. I can’t remember exactly what was said at that moment since I stopped listening as soon as I heard the words "I haven’t seen this breed run in over 20 years..."
I knew then that Darcy had done what I had been told by so many people for so long he could never do. He had won against all odds competing with the field bred springers. Deep inside I had only ever hoped that he would place, but never really expected it. The judge asked me to give an acceptance speech, but I was so choked up and trying so hard not to cry that I could not do so. I am not sure I succeeded in conveying a few words about being happy that field spaniels could hunt. It was an odd comment since I had always believed they could hunt from the start. Having won a limit class, Darcy is only allowed the chance to win one more. And being the dreamer that I am, I am going to keep at it. There is also the impossible goal of the open stake, but impossible doesn’t seem so crazy anymore. Even if we never a place in the open stake, I know we will both have learned a lot along the way. I was able to change some minds that day about an often overlooked rare breed and I’m more proud of that than any placement. 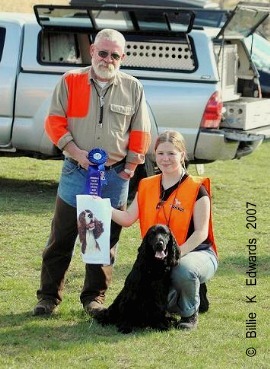 Sonya Haskell currently lives in Ottawa, Ontario, Canada where she is posted as a Corporal with the Canadian Armed Forces and lives with her two Field Spaniels Darcy and Ember. In her spare time she is also working towards her Bachelor of Science degree through correspondence with Athabasca University, as well as being an avid dog enthusiast. Under the kennel name of Pemberley Reg'd Field Spaniels, she works Darcy with the Ottawa Therapy Dogs doing rehabilitation work on patients at the Ottawa General Hospital, competing in both CKC and AKC Conformation Shows, as well as Obedience, Agility, and Hunting Trials. Her youngest dog Ember has started training in all of these arenas as well." Photos courtesy of Billie K. Edwards. You can view more of her work at Fast Track Springers.